As the majority of the nation enjoyed an extra hour in bed, there was no rest for our clockmakers as they began the monumental task of altering public clocks across the UK. 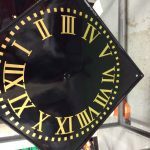 Of course, it’s not all public clocks which have to be changed manually, there are more pendulum regulators being used thus meaning less work for our clockmakers when it comes to this time of year. However, it is still a major operation which involves accurate planning and a dedicated team of clockmakers. “The planning for this operation starts in the height of summer as routes are planned and clockmakers are identified depending on their location across the UK. We try and use the same route every year, but this has to be flexible as some clocks have newly fitted PAR’s, therefore they no longer require manual adjustment and the route needs to be adapted” explains Annie Barlow, a key member of the Smith of Derby planning team. In England the team aim to alter every clock within 3 days of the GMT time change. The process starts at 8am on the Sunday morning, as clockmaker Tim Barlow, Annie’s father, annually adjusts the clock at Derby cathedral. Tim explained that “the process for Derby Cathedral is to stop the pendulum for an hour, because it not only strikes the quarters and hours but is also linked to the carillon. However, if a site doesn’t strike we simply wind the clock forward 11 hours.” Following Tim’s visit to the Cathedral, he headed North East to Newcastle where he will be completing clock alterations in local communities. However, it is a much more complex operation in Scotland. Craig, our resident clockmaker above the border, works tirelessly both the week before and after the GMT time change to complete the clock altering. “Scotland is a logistical challenge, the clocks which require manual adjustment are spread across the country and simply don’t fall in the clusters in certain areas which they seem to do in England” explains Annie. 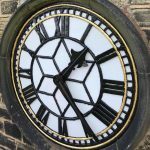 Whilst this operation can be challenging, it is one everyone at Smith of Derby enjoys and we look forward to continuing our clock altering work in the future!